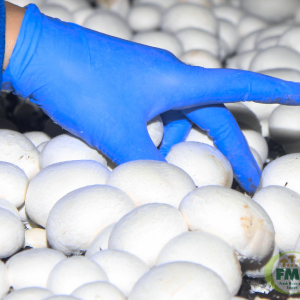 Our mushroom nurseries are located in the direct vicinity of FME, near the border with the Netherlands. The cultivation process is entirely in hands of our growers. They take care of harvesting and initial processing. The cultivation cycle of a mushroom crop is approximately six weeks. Mushrooms grow for sixteen to seventeen days, after which harvesting can take up to four days. After the initial crop, a second crop grows one week later, which is then also ready for harvesting. Everything is then disinfected, and growers lay down fresh compost and topsoil, and the cycle can start all over again. Excellent quality control is crucial throughout.